Tomorrow night my gentleman friend and I are throwing a combination Halloween/House Warming party, so I will use it as an excuse to share the “secret” recipe for my kiiiiiiinda famous spinach dip. I first made it at a lakehouse weekend with some friends and have been perfecting it–and trotting it out at just about every party/pot luck I’ve attended–ever since. The “secret” ingredient is goat cheese. (Shhhhhh) Below is what I have determined, via years of research, to be the definitive recipe. Veggies, pretzels and pita chips compliment the dip particularly well, but the best option is torn up pieces of bread drizzled with olive oil, sprinkled with kosher salt and black pepper, and toasted in a 350 degree oven for 10 minutes or so. *Since its the titular ingredient, I feel like I should expound upon spinach options for a moment. I used to exclusively use fresh spinach, and would use 2 bags of baby spinach or chop up 2 bags of regular spinach before sauteing. 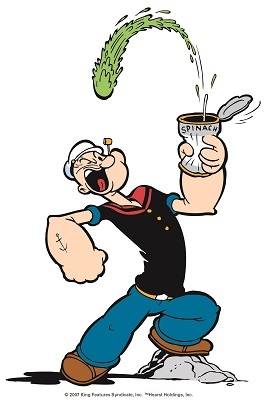 Ultimately, I realized fresh spinach was a waste of money–it is significantly more expensive with no additional flavor benefits. Of all available options, the frozen chopped spinach block has the best texture, color, and and consistency, has little-to-no added sodium or other preservatives, and is less than $2. Lately I’ve been buying my dip supplies at Aldi’s, which doesn’t sell frozen spinach, so I’ve settled for canned to avoid making an additional stop. Though canned spinach is pretty unappealing on it’s own (especially when you first open the can), after it’s been sauteed and seasoned and mixed with the other ingredients the difference in quality is unnoticeable, and I do appreciate how much quicker the sauteing process is versus the frozen. Sautee spinach on medium with a healthy drizzle of olive oil, a splash of your vinegar, a generous amount of black pepper, and a pinch or two of salt. (If using canned spinach, drain and rinse before sauteing and skip the additional salt). Cook until spinach is heated through (and wilted, if using fresh leaves) and there is no extra liquid in pan. Remove from heat. Put goat cheese in a large bowl. Add spinach and stir until the two are combined. (The goat cheese will be stiff at first, but the hot spinach and the stirring will loosen it up). Add the sour cream, raw garlic, mayonnaise and a good amount of dill (I usually sprinkle on enough to lightly cover the top of the bowl. Mix all ingredients together then transfer into serving bowl or tupperware, cover, and refrigerate for at least an hour to let the flavors meld. Can be prepared the day before serving.